We Are Winning! Peace Action @ Weapons Expo 2018 - World Beyond War . . . The 2018 Weapons Expo and the accompanying campaign to shut it down are finished for the year. 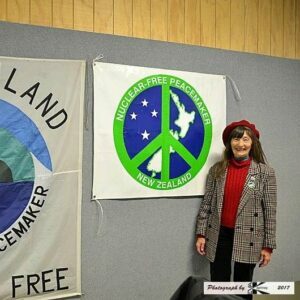 It has been an awesome and successful week for the peace movement in Palmerston North, and the urge to keep struggling has only grown stronger. It is never easy to stand up to the largest and most powerful industry on the planet – the weapons trade – but it is clear that our work and our tactics are bearing fruit. The diverse group of people making up Peace Action Manawatū engaged in critical work across their local community. They built real support and alliances from church groups, refugee and migrant groups, artists and businesses. They were patient and persuasive, acting with honesty and integrity in bringing the issue of the Weapons Expo to the City and the Council. They found a great deal of support within the Council. Unfortunately they also found some bastions of support for the NZ Defence Industry Association from the Mayor and his Deputy. The former had agreed to the event without any input from other Councillors, and sought to hide the extent of his communications with the event organisers by directing them to contact him only by telephone. He gave an opening welcome to the Expo, and has publicly called for the event to be held in the City again next year. His conduct is not surprising given the addictive nature of power, but disappointing for many who had called him an ally on other issues. The Event organisers also sought to impose an illegal roadblock around the venue, forcing essential community organisations to close or curtail their services during the duration of the event. A legal challenge to this mitigated the worst effects, but there is a lack of understanding of the NZ Bill of Rights by Council, particularly in terms of people’s rights to freedom of movement and protest. 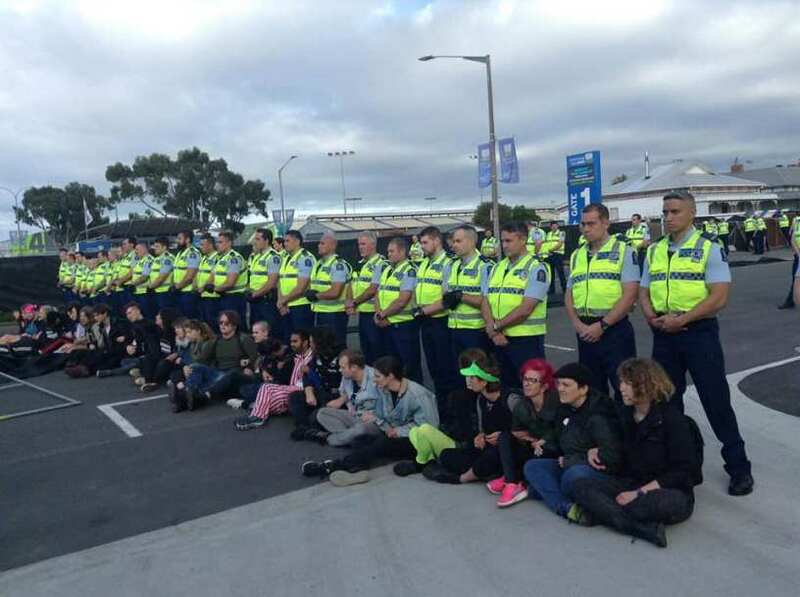 The gargantuan police presence and astronomical budget of $250,000 was seriously ramped up from last year, and also strongly suggested a desire to protect delegates at any cost and with any amount of injury. The arrival of the Weapons Expo was of course preceded by its ignominious departure from Wellington after 20 years in the City. This was the result of last year’s amazing organising by Peace Action Wellington – again both in terms of putting the issue before the Council and a more sympathetic (or perhaps just more calculating) Mayor, and organising people across the city and the country to descend upon the Cake Tin for hours of blockading. The groundwork for the action this year had already been laid by three plus years of regular campaigning, networking and upskilling. The tactics of choice for the actual days of the event have been non-violent direct actions that seek to delay, disrupt and otherwise deny entry to delegates seeking to attend the conference. This has proved successful again this year. On day one, fences and gates of the illegal roadblock were torn down and laid across the road. This was followed by rolling blockades of delegate buses and occupations at entry gates. These blockades delayed the start of the conference by approximately three hours. Following on from the blockades, a vibrant peace march gathered in the Square and after speeches set off to the venue. 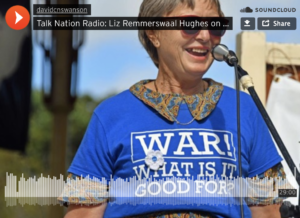 Hundreds of locals and people from across Aotearoa marched against the weapons trade. The day’s actions were attended by a huge range of groups including the Pacific Panthers, Political Organisation Aotearoa, People Against Prisons Aotearoa, Metropolitan Church in Progress, St John’s Theological College students, Quakers, Tāmaki Makarau Anarchists, Berrigan House, Catholic Workers, Climate Justice Taranaki, the Green Party, World Beyond War, the Peas for Peace, unionists and feminists. The March was gifted a stunning blue sky and warm sunshine. It was a fantastic affair with giant puppets, smiling painted faces, and lots of diverse messages of peace and justice. For Palmy residents, it was certainly an attention grabber. Not content to rest, members of the Peace Movement reconvened in the afternoon for a kids Witches and Warlocks party at the “roadblocked” Women’s Centre, and then marched around the events centre, successfully keeping security and police on high alert. When Day 2 rolled around, the weather packed in, but the spirit of resistance did not. We were up early and deployed to delegate hotels around the city. When the first bus was spotted, an impromptu blockade jumped into place for a moment, followed on by an agile climber who hopped up on the roof of the bus. It was pouring rain – no, really, bucketing down. Once that climber was up, we knew that bus wasn’t going anywhere so some crew headed down to another bus, and one, two, three – another climber was up on top of that one, too! Empty buses were spotted parked up down the road from one hotel, so some crafty people blockaded them front and back with wheelie bins fortuitously parked on the footpath. After that, there was a bit of a game of catch-the-moving bus as delegates ran the gauntlet of resistance. Kuia sang peace songs outside the coffee shop where delegates had sequestered awaiting transport, while other activists attended to individual delegates who braved the streets. When we finally called it a day, we had again delayed conference attendees for three hours – and though we were soaked to the bones – the action was effective. We celebrated our success and solidarity at the local artist run space – a huge and wonderful creative place – where we ran down a debrief with hot drinks and yummy kai. The last action of the week was a breakfast noise brigade – at the Hotel Coachman – targeting the advertised “post-Event” speaker and meal. It was a bit of a parting shot to the NZDIA that wherever they go, we’ll be there. There are a lot of amazing things about this campaign, but the one that stands out is the power of collective organising and action. Though we face a far better resourced opponent – literally an army – we are winning. The strength we have is the strength of the many against the few, the strength of creativity, autonomy and spontaneity against centralised authority and uncritical adherence. These strengths guide us and give us hope for the future. They provide the building blocks for a new world in the shell of the old. So let’s get on with it – let’s keep building our movements and our connections with each other, let’s deepen our commitment to waging the many struggles that our world is confronting and to each other as friends, comrades, lovers and families. Another world is possible. It’s within our reach. It’s up to us to make it. Wonderful to see and read about All of these activities for Peace building. We are just getting started!